INTRODUCTION: While contemporary sf is very diverse, encompassing everything from space opera to near-future to alt-history and steampunk, when I think of "pure sf" as the genre has originally evolved to intermix scientific speculation with literature, there are only two authors of today that stand at the top and one of them is Greg Egan whose superb far-future novels like Incandescence, Schild's Ladder or Diaspora combine the cutting edge of today's science with entertaining story-lines. 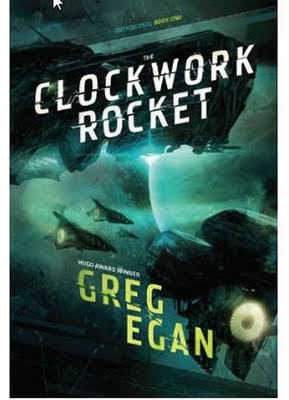 Also Mr. Egan's short stories which are combined in several collections, most notably Luminous, Oceanic, Dark Integers and Crystal Nights and contain some of the most mind-blowing sf at short length that I've ever read, are mileposts of today's genre. I have read almost all of Mr. Egan's work from the first novels like Permutation City and Quarantine to his prodigious short fiction output with only the two notable exceptions of his near future novels (Teranesia and Zendegi) which are of less interest for me and I never failed to be blown away by his ability to put the most abstract and farthest reaching concepts of modern science in a story that entertains and moves. OVERVIEW/ANALYSIS: "The Clockwork Rocket" is the perfect sf novel and a clear example why sf is still my favorite genre; on the one hand there is sense of wonder given by the speculative but informed exploration of an universe with definite though different laws of physics than ours, on the other hand the book flows on the page and it has in Yalda one of the best main characters in recent memories, while the supporting cast is well drawn and distinctive. The protagonists of the story are strange: the metric of the universe requires complex molecules to be really complex so to speak, so all life is shapeshifting; our heroes are six limbed shapeshifters, symmetric in 3D in their "normal" form - so they have eyes both back and front for example - that emit light, sleep in beds dug in the ground to cool down - though of course the well off in cities have special cooled beds. The book follows the "solo" Yalda - ie she "ate" her twin in the womb as the other "normal" children tease her - from a farmer family but who is lucky enough to have a father who appreciates learning and who has promised Yalda's mother to school any of the offspring that shows inclination. So despite being almost twice as big as the normal female - and females are considerably bigger than males here for obvious biological reasons - and not expected to reproduce - ie be quartered in four - in the usual age range due to the lack of a twin mate, so being potentially of huge help on the family farm, Yalda gets to go to school and later is admitted to the university in one of the cities that form the civilization of the planet. So there is discovery, drama, even the stirrings of social change, while in the second part of the book the pace accelerates and the book becomes a true sf classic of people learning to cope with new, challenging and unforeseen circumstances, while Yalda's saga continues towards its clear conclusion. The novel moved me deeply too and I *really* want the second installment to see where the story goes next since there is ample scope for surprises and the author surely did not show his full hand about his exploration of this wonderfully imagined universe. "When Yalda was almost three years old, she was entrusted with the task of bearing her grandfather into the forest to convalesce. Who is the other one beside Egan, Peter Watts, or Stross in his Accelerando mode? Currently $3.99 in US Kindle store. I'll try and check this out. I'm surprised you didn't reference Asimov's The Gods Themselves since that is the canonical example of aliens who form single identities from multiple life forms. I'm a huge fan of Alastair Reynolds, but threw away Accelerando after a few chapters as unreadable. I see what you are saying about The Gods Themselves but here it is different - there they meld, here they split; this results in vastly different cultures.